As I was browsing the Neiman Marcus website the other day my eyes were immediately drawn to the picture below – I’m not sure what did it, but I am just enamored by the setup of this room and all of the beautiful details (I want to hire whoever styled it for the photoshoot to decorate my future home). 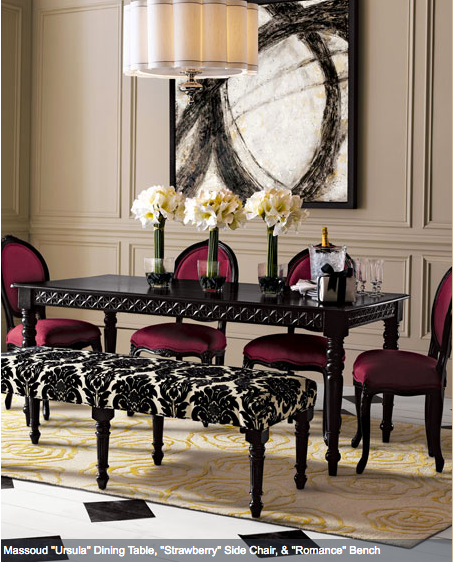 I especially love the black and white bench paired with the raspberry dining chairs – a perfect collaboration of color and patterns. Not too much and not too little. It looks very New York to me – simple and elegant! Click on the image to view the information on the entire Massaud collection.